Shoot Yer Mouth Off is a Mic minigame in Mario Party 6. Its name is a pun on the phrase "shoot your mouth off", which is when a person talks too much in a very loud and uncontrolled way. The team players look around, and get surprised when the Bullet Bills and Bob-ombs appear on-screen. 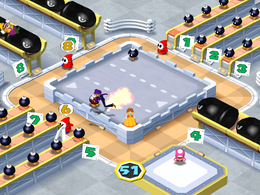 The player with the microphone says a number from one to nine into the microphone to make Shy Guys shoot Bullet Bills or Bob-ombs into a isometric arena where the other three players must dodge them. If a player is touched by a Bullet Bill or if a Bob-omb explodes on them, they are out of the game. Also, if the player says zero into the mic, a group of three Thwomps will fall in a random location. 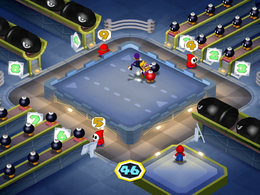 Rules – "One player gives attack orders to Shy Guys while the other three avoid a bombardment of Bob-ombs and Bullet Bills!" Advice 1 – "The Solo Player should order attacks from every angle. The other three should watch the Shy Guys for incoming attacks." Advice 2 – "Shy Guys can't take orders when they're preparing for an attack. Wait until one of them is idle until you give another order." German Baller, Mann! Shoot, Man! Despite the game calling them Bullet Bills, the enemies more closely resemble Banzai Bills with their noticeable smile and lack of arms. This page was last edited on January 16, 2018, at 14:22.